What a mess… What a huge… Colossal mess. The first episode had me in denial, the second began to show some real problems, and the third? 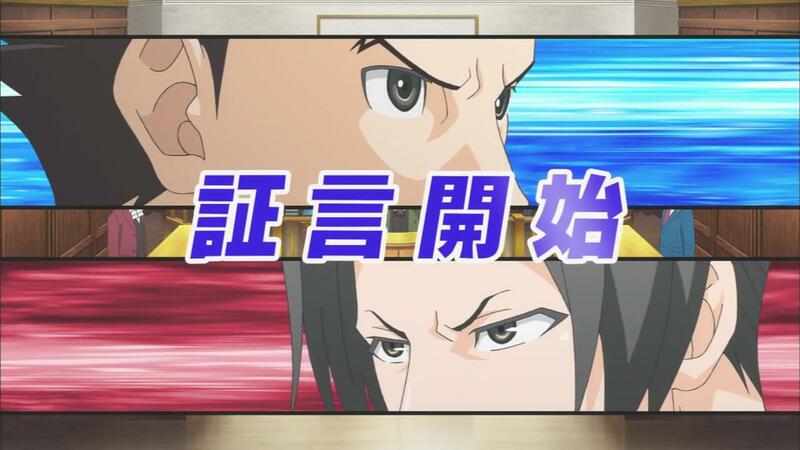 Well… The third ala this week’s episode was the episode where a fan’s worst fears were truly realized. 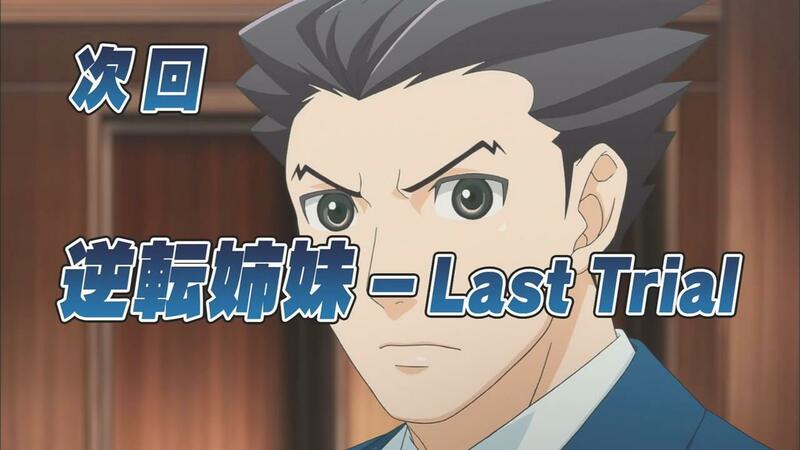 There’s no sugar coating it; The Ace Attorney anime is terrible. Its bad, its not worth your time and a complete utter waste. This anime adaption, of one of the best adventure games of all time is a phoned in, sloppy and disrespectful mess. Its an adaption that completely disregards the nuance and potential of its stellar source material, twists and compacts it at every turn, and then rushes through the material, all without a care in the world. Before we get into why all of that is true, lets talk about the source material itself for a second. 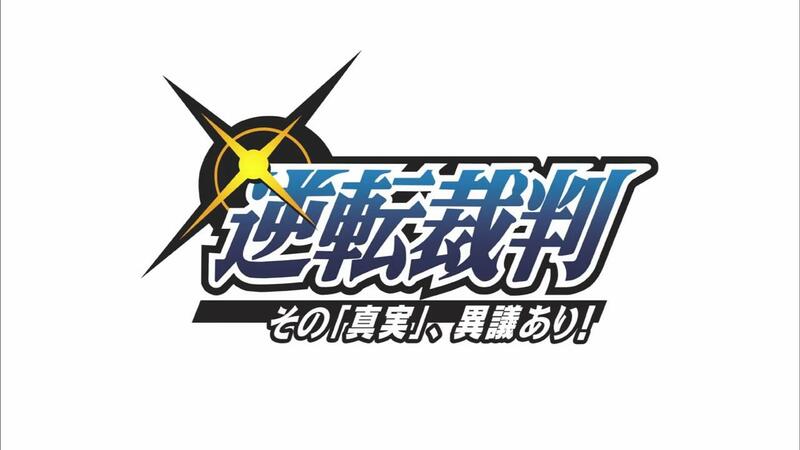 The Ace Attorney games are kind of famous in the adventure game world. A big part of that is because they give you the experience of being a lawyer in an elaborate, intense courtroom drama. The pieces are all there in every “case” that Naruhodo/Pheonix Wright tackles in the games. There’s a complex and odd scheme that makes the defendant look pretty guilty, there’s shifty characters, a conspiracy to hide the truth, and a killer, all waiting to be solved and taken down inside the courtroom itself. 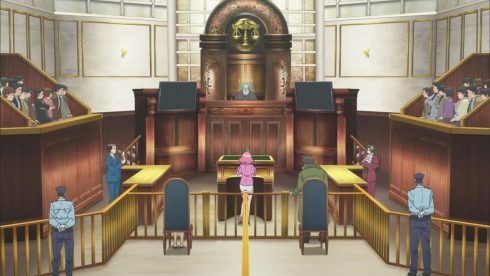 What’s so fascinating about the Ace Attorney series is how its essentially a series of murder mystery stories that are all solved in the courtroom itself. The deduction and sleuthing is done by lawyers rather than the more traditional “detectives”. The police work is already done here. 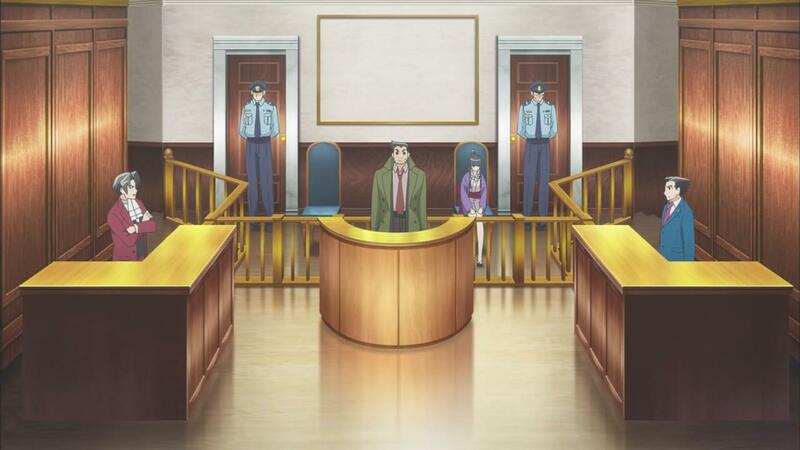 The evidence is there, the witnesses are there, and its up to one lone lawyer, i.e Naruhodo to stand in between the victim/defendant and an unfair judgement. There’s also the added layer of the Japanese Judicial system itself, if only because in Japan, the acquittal rates are terribly low. There’s an excellent article on the escapist about the facts regarding Defense Lawyers and Japan’s legal system, so I highly recommend you read that if you’re interested, but… My point is this: There’s a lot of nuance, depth and heart to the story, dialogue and characters of Ace Attorney, at least in the games. Your Honor, I hold in my hands the terrible script for this week’s episode! The Anime? Well… Its managed to trample and ruin every bit of nuance from those games, and bring in a very lacking and frankly poor summary of it all. The story lacks the heart, excitement and quite frankly any semblance of entertainment or impact because it guts and cuts a huge amount of content from the original story. Why? Simply because this adaption just can’t seem to patiently take its time, and develop any sort of rhythm, momentum or excitement. The show reinterprets and summarizes events in a way that leaves them shallow, boring and downright underwhelming. The experience of watching this anime adaption almost completely and horrifyingly mimics what I felt when I saw BlazBlue Alter Memory. There’s this RUSH to get somewhere and do it as quickly as possible. There’s no care, love or quite frankly patience in the story, and it just of jumps, from moment to moment, making it all feel very jarring and quite frankly rather bad. Compared to the games, this episode and the events that transpire in it, are an insult to any fan. But, even if I were to somehow disregard that idea, and not compare the anime to its source material, even then… This is just complete garbage. 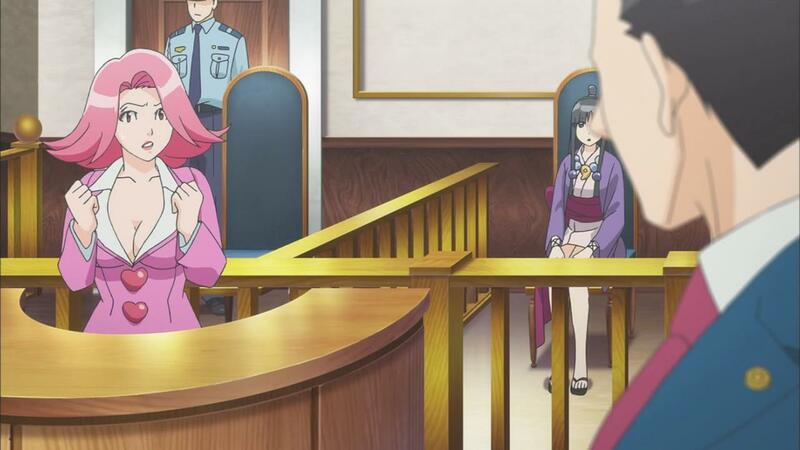 The courtroom battle between Reiji and Naruhodo? The one that was built up at the expense of the actual crime’s setup last week? Its over swiftly and quickly. While it does seem to make some semblance of logical sense at first, the journey to get there is less so a journey and more so a series of quick steps. 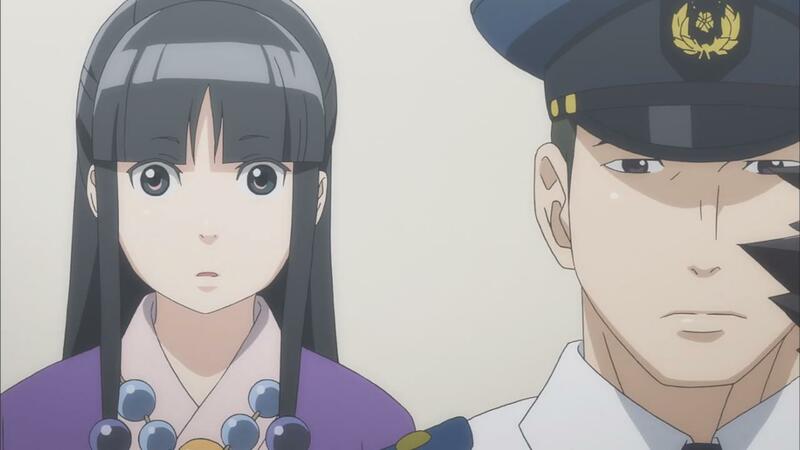 Naruhodo and Reiji call upon Detective Itonokogiri as the first witness, and things go from bad to worse there. 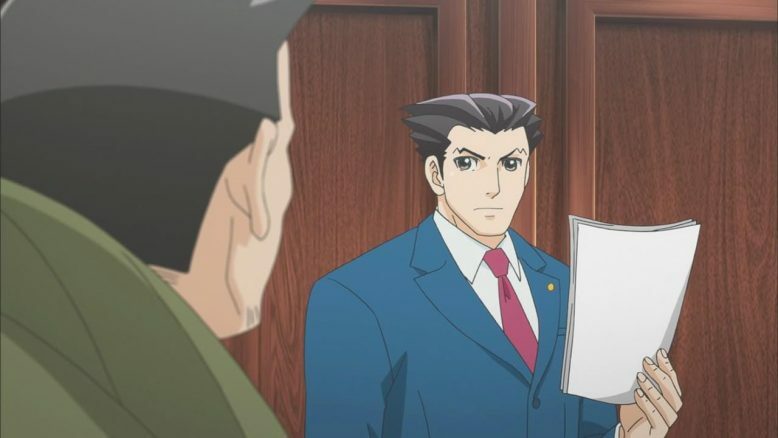 There’s tesimony and some bad attempots at humor, but shockingly, there’s no cross examination from Naruhodo shown at all. 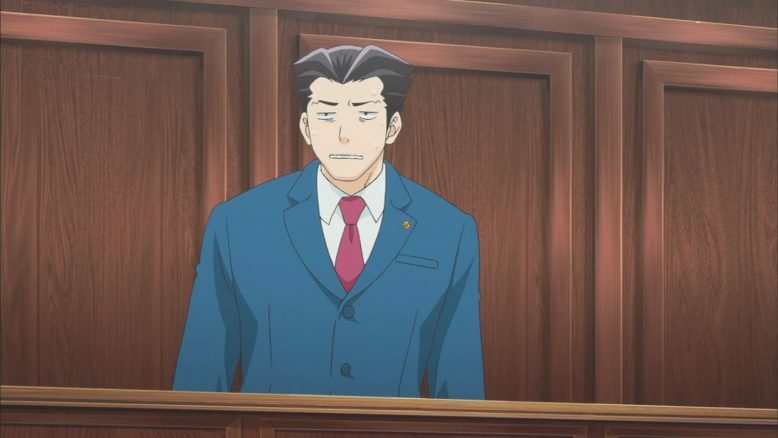 Itonokogiri simply states a garbled version of his actual testimony from the games and instead of having Naruhodo systematically breakdown and call out the contradictions in it, we just have one quick objection, and then its on to the next witness. 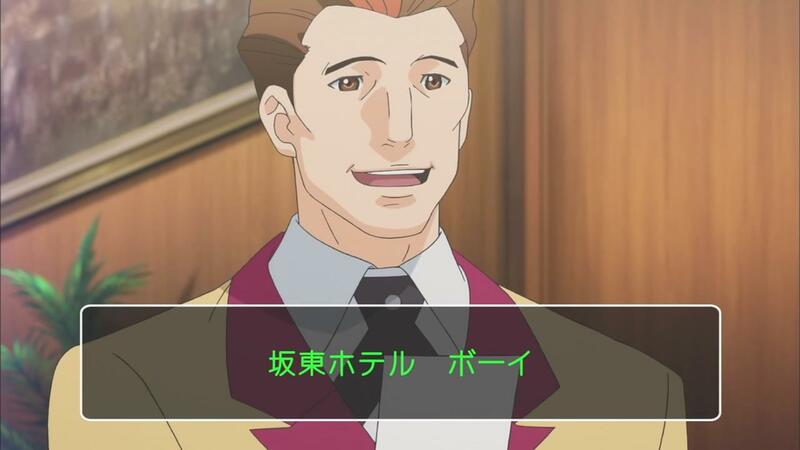 The second witness in question, Shouchiku Umeyo (April May in the games), doesn’t fare much better. Her entire testimony, which takes a good deal of effort and bluffing on Naruhodo’s part in the games, is once again, just quickly broken apart with a single objection. And then there’s the big moment with Umeyo’s whole change in character happens. It comes off abrupt, sudden and ends up looking comical and cartooney, in a really bad way. Look, I’m not going to argue and say that Umeyo doesn’t have that sense of “odd” in the games, but the context of it all gets horribly muddied here. 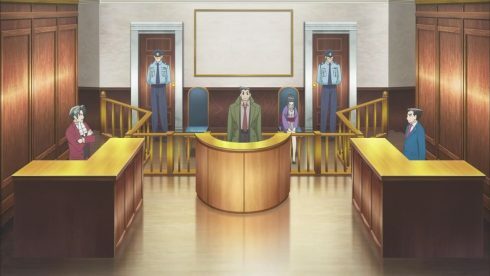 See in the game, Umeyo’s testimony is pretty darn long (as is Itonokogiri’s for that matter), and there are multiple times where Naruhodo is about to lose the case. 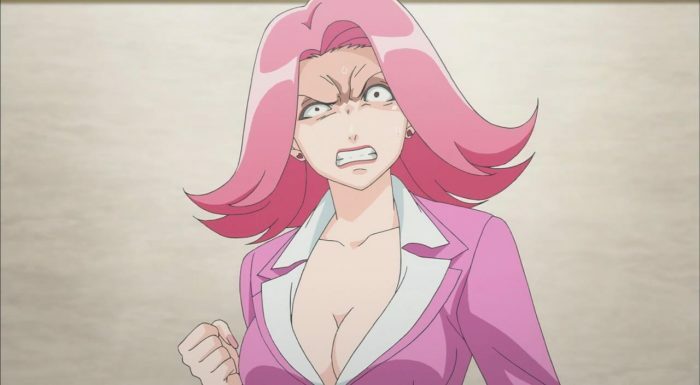 He does, however, manage to bluff his way into tripping up Umeyo, which leads him to pointing out her lies, and each time he does that, she freaks out and loses her “cute girl facade”. The idea is to show Umeyo as a two faced woman, one that’s pretty on the surface, but darn terrible on the inside. She’s a very on the nose character for sure, but she’s distilled down to just flippant and weird in this episode. 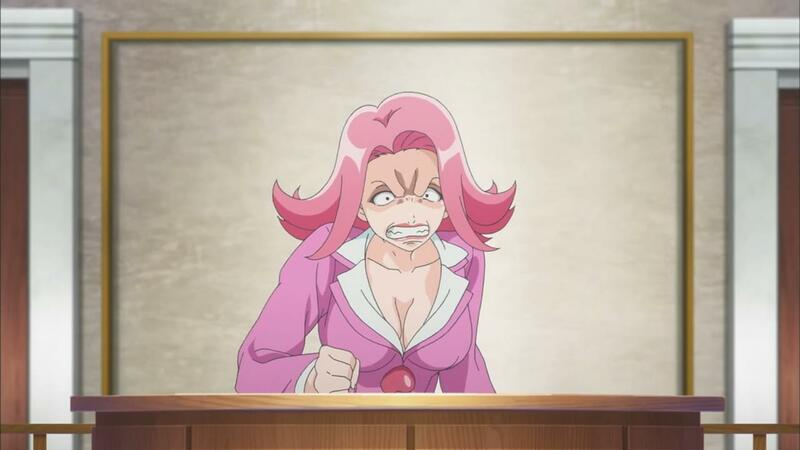 Her sudden freakout just seems to mirror what we saw the first criminal do in episode 1. And that’s the problem isn’t it? The adaption seems to think that its found the pattern. Witness comes up, witness makes a mistake, Naruhodo catches them, and they change into a completely different person. Except that… There is no real pattern in the actual story. This is the show and its production staff taking a very cursory look at the story, thinking they understand it, and then just jamming what they THINK is the essence of the story, into the episode. 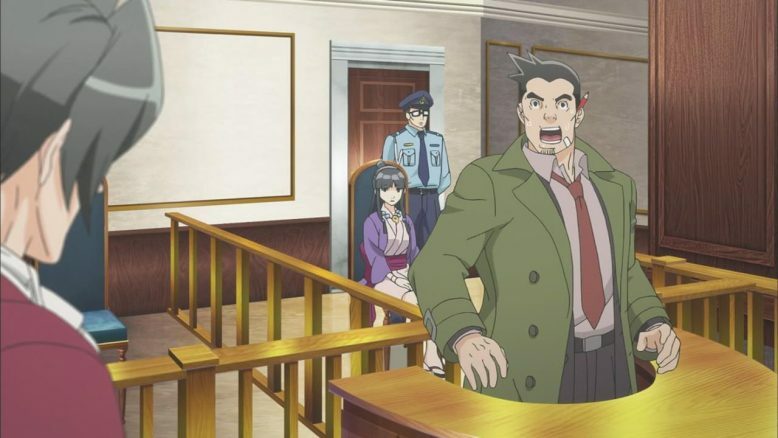 Fact is, that had this been a proper adaption, the episode would have completely and totally dedicated its entire runtime to the courtroom part of the story. The courtroom is where the action is after all, and its where Naruhodo ends up turning the tables on both the lying witnesses, and the prosecution. There’s also a real game of chess, or something more akin to tennis, between Reiji and Naruhodo. Reiji will bring forward some piece of evidence or a witness, and Naruhodo then goes towards breaking it all down, only to have Reiji come up with something to counter that, and then obviously that back and forth continues until Naruhodo is able to completely dominate and prove his points. Yet, there really isn’t much of that in the episode this week. Hell… Naruhodo ends up being more or less a timid, and reactionary character, instead of the confident and capable hero from the games. On top of that, we actually have frigging Mayoi voice a “Matta!” (Hold It!) herself to save him from absolute failure. It goes without saying that that doesn’t actually happen in the game, and Naruhodo ends up forcing his way to the truth, entirely by himself. That’s a pretty big change, because it once again, undermines Naruhodo as a character with actual competency and agency. 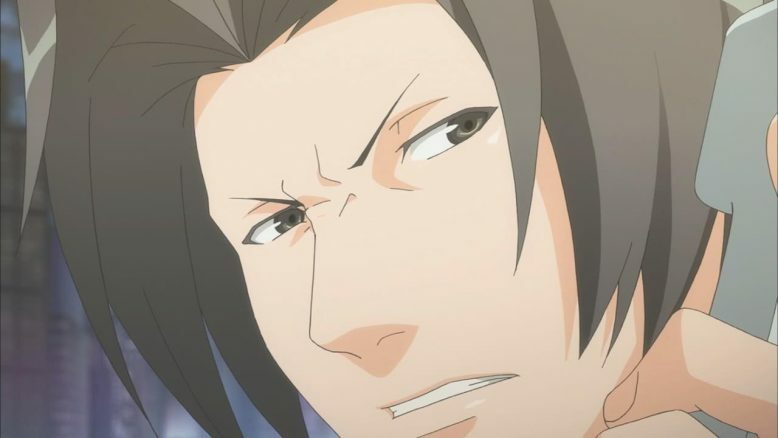 The entire tone of his character, is more or less timid, confused and meek, and a lot of that is compounded by the miscasting of Kaji Yuki in the darn role. I thought I could get used to it, but quite frankly Kaji just seems to be interpreting the character in a very odd way, and making him into something very different from what fans of the games are familiar with. Speaking of things to be familiar with, the second half of the episode, where Naruhodo goes to investigate things, is also horribly different from the games, And yes, its all different in ways that just fundamentally change the heart of the story. 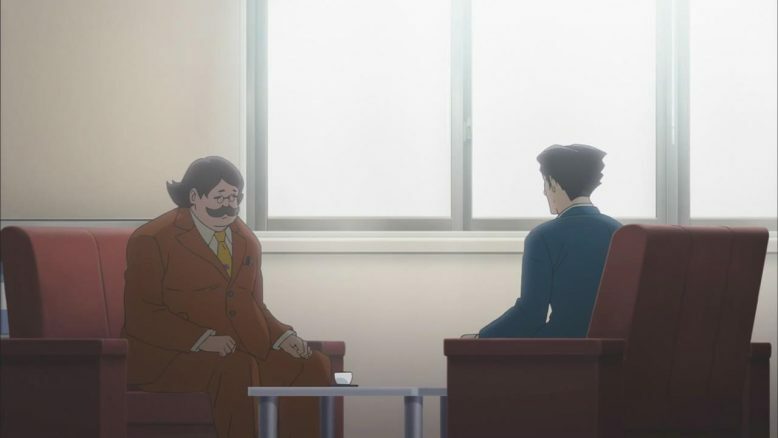 In the games, Naruhodo does end up being framed as the murderer, but he does do a fair bit of leg work and solid detective work, before he brazenly goes and confronts Konaka. 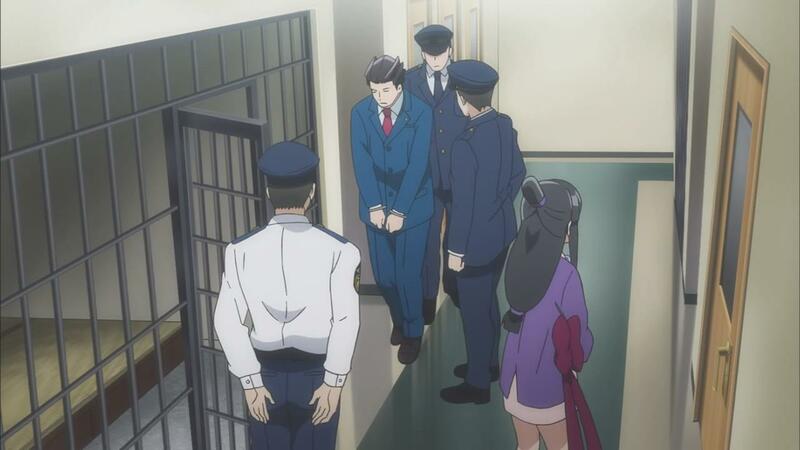 Naruhodo actually ends up questioning Umeyo in the detention center. BUT! Even before that, lets talk about the Bellboy. The bellboy, who reveals the important fact about someone having checked in with Umeyo, is actually a witness in the courtoom part of the story in the games. Yep, the bellboy and that whole reveal of Konaka being potentially in the same room with Umeyo? 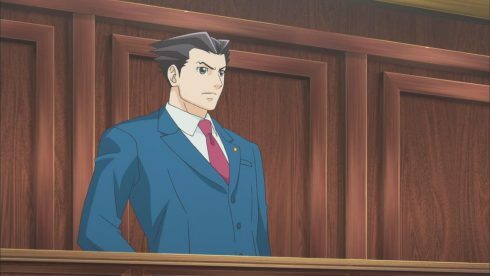 That’s something that Naruhodo reveals in the courtroom (in the games) and doesn’t just suddenly HAPPEN upon by sheer luck. 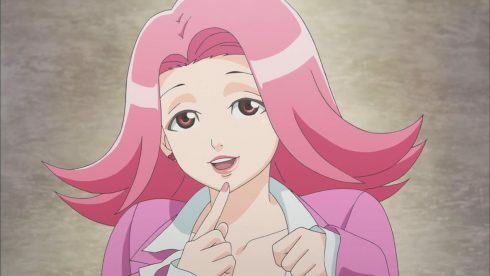 Its a hard earned breakthrough, and it also reveals that Reiji, the prosecution in this case, had taken steps to suppress this information. 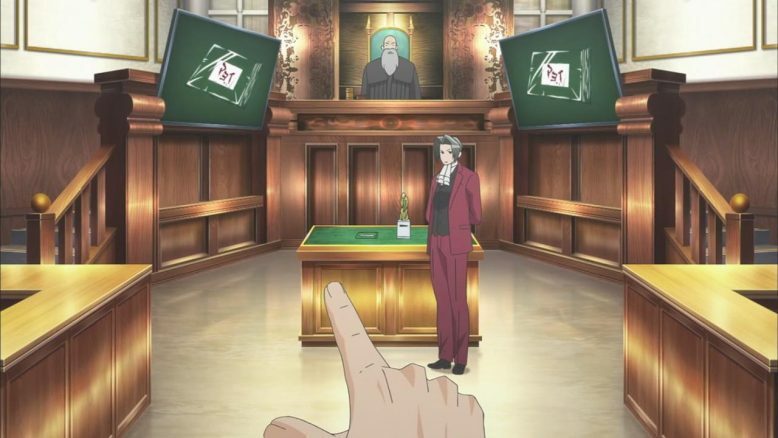 And the reason the court is adjourned isn’t because Reiji calls for a recess, but rather because he’s reprimanded by the judge and told to investigate the incident properly. So again, these changes are paramount, because while they lead to the same destination, i.e Naruhodo getting blamed for the murder, they make him look a lot dumber, and they honestly make the sudden accusation it all quite cheap. And the big change? Well its how you perceive the capture of Naruhodo himself. That particular event actually becomes kind of a blessing in disguise. After it all happens, Konaka is tied to the case as a witness, having accused Naruhodo of being the criminal. its a rollercoaster ride and one that ends in quite the cliffhanger. Naruhodo beats the odds, only to end up at rock bottom by the end of the day anyway. 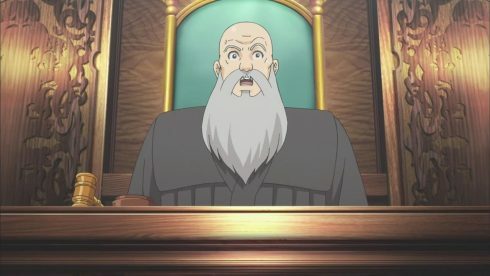 Instead of that… That great rollercoaster ride, of highs and lows, of Naruhodo coming back multiple times from the brink of of despair and turning the tables, we get this horribly chopppy courtroom fiasco. Then we have most of the drama revolve around Naruhodo being told a sob story by the famous lawyer (who for some reason is made a lot more sympathetic here) and then led toward Konaka, who’s waiting for him with a trap. Don’t even get me started on Konaka’s weird engrish speech patterns, and how terrible of a character he comes off as in the anime. Its just another one of those mistakes, in a series of missteps that this series just continues to take. I’m honestly of the mind that I should just drop this series. Its bad, its so much worse than the games, and just as a stand alone production it fails on multiple levels. Its heartbreaking for someone like me, who’s such a fan of the games, and who was always kind of dreading this day, because of the potential for failure. The failure is there, and its clear now that the anime has no interest in doing justice to the source material. This is one of those projects that is just being shoved out of the door, with little care, budget or respect for anyone, be they newcomer, or diehard fan. Honestly, just google or youtube a video of the first case of the source game, and you’ll really understand how bad this adaption really is. And you’ll have a lot more fun just watching and reading the game, rather than this garbage. 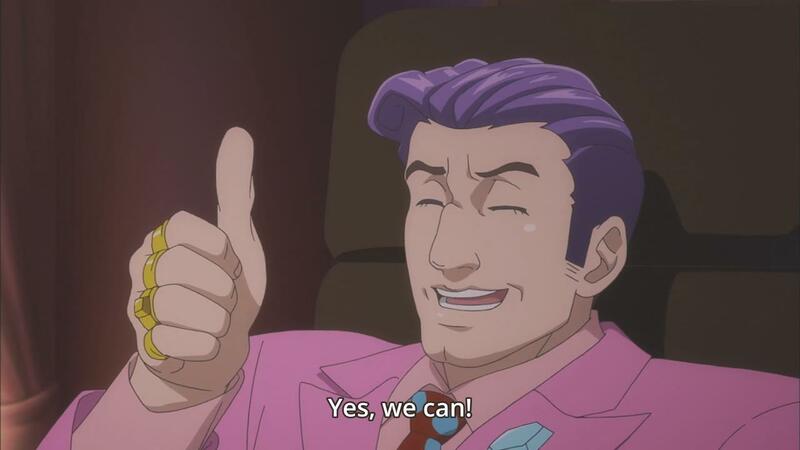 Mainstream game anime adaptions are the new low of the anime industry, and while I think I’ll stick around until this case is done at least (i,e next week), I’ll probably drop it soon after. Once again… Please, Do yourself a favor…. Really, I implore you, to just play the games instead of watching this. 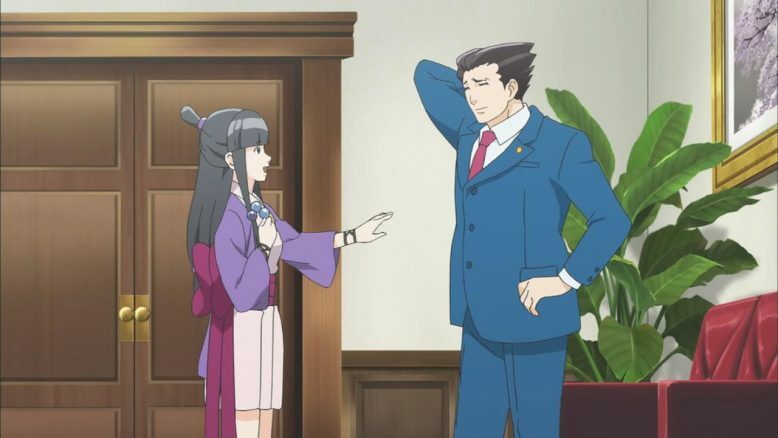 This anime is not an accurate or even a slightly fair representation of what Ace Attorney really is, and it continues to be an absolute tragedy, because no one really cared for or understood what they were doing with this series. Next week is more than likely going to be my last time covering this series. See you next week.